The main objective of this project is to study the mechanism governing the pre-mRNA processing in plants. Unlike vertebrates, this fundamental process that is required for the expression of all eukaryotic genes is poorly understood in plants, due to a lack of in vitro splicing assays in plants. Furthermore, alternative splicing, a process by which many eukaryotic genes encode multiple transcript isoforms via different selection of splice sites, is emerging to be far more prevalent in plants than initially anticipated. These have been indicated to play important roles in many physiological processes in development and plant response to environmental cues. A better understanding of alternative splicing in plant requires molecular and biochemical characterization of the factors that participate in this process. Of these factors, a class of serine/arginine-rich (SR) proteins plays a central role during both normal and alternative splicing. We have implemented both computational and experimental approaches to study the expression profile of SR proteins in maize and other plant species. We report the occurrence of several isoforms of maize and sorghum SR mRNAs isoforms. These isoforms display evolutionary conservation of splicing events with their homologous SR genes in Arabidopsis and moss. Our data indicates an important role of both the 5’ and 3’ untranslated region (UTR) in the regulation of SR gene expression. These observations potentially show the importance of this process in evolution and adaptation of plants to land. We have generated various SR gene knock-out mutants of maize that are defective in endosperm development caused by an insertion of the Mutator (Mu) transposon. We are performing molecular, biochemical and genetic approaches to decipher the role these SR genes play during the development of seeds. ​​Molecular and Genetic Characterization of Helitrons, a Highly Abundant, Important and Novel Family of Transposable Elements: Transposable elements are mobile genetic entities that move and insert into different regions of the genome. These elements and their derivatives constitute the major portion of virtually all eukaryotic genomes. These elements have also significantly contributed to the evolution and expansion of eukaryotic genomes. Helitrons are a novel family of a recently discovered transposable element, and were first discovered in 2001 by computational-based analysis. These elements constitute up to 2% of some plant and vertebrate genomes, and bear unique structural features that are not present in other known transposable elements. Despite their abundance, an active Helitron element capable of transposing, or of movement by itself, remained elusive to date in any organism. These observations indicated that, despite their vast abundance, Helitrons might be extinct and no longer active in the present day genomes. 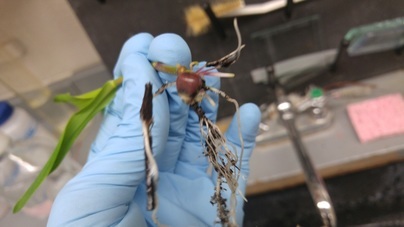 Our laboratory reported two maize mutants caused by a recent insertion of a Helitron, and provided the first genetic evidence that these elements are active in the modern maize genome. Our data also provided evidence of a massive presence of Helitrons in maize, where they have mobilized thousands of gene fragments into different regions of the genome. The mechanism of gene capture and its advantage to the host genome, or the element, remains unknown. We also provided evidence that Helitron-captured genes are frequently transcribed, giving birth to chimeric transcripts intertwining coding regions of different genes. These may potentially evolve into new genes with novel domain and function upon natural selection. In addition, alternative splicing by differential selection of splice site during pre-mRNA processing dramatically augments the transcript diversity of Helitron-captured genes in maize. Thus, Helitrons are potentially a driving force for the evolution of new genes in maize. Recently, we also demonstrated differential splicing of Helitrons between maize inbred lines. By comparative genomics, we identified key polymorphisms that are potentially involved in splice site selection during pre-mRNA processing.Despite their wide abundance and importance, the mechanism of Helitron movement and gene capture currently remains undetermined, primarily due to a lack of assayable Helitron activity. Our data provides evidence of their recent movement in the maize genome. My research objective is to use maize as a model system to study the mechanism by which these elements transpose and capture gene fragments.